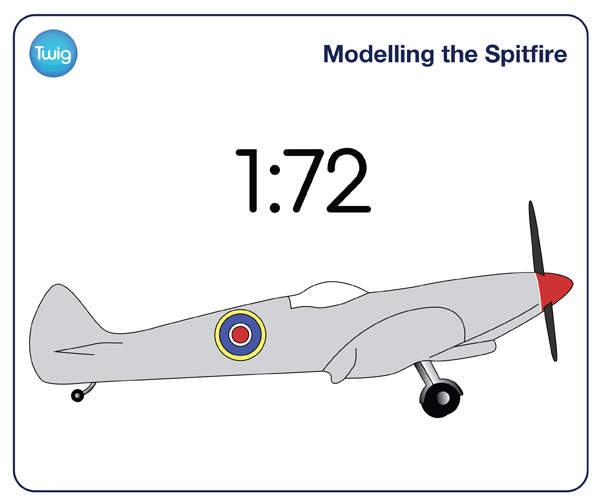 Though the world's first model aircraft, a Spitfire, was built in a scale of 1:75, the resulting model would fit into the full-size equivalent more than 370,000 times over. Discover how scale is calculated in three dimensions. This is one of the most iconic planes of the Second World War – the Spitfire. And despite being a fraction of its original size, this model remains an accurate copy of a full-size plane. This is made possible by using scale. Scale is used to represent the proportions of a given object – seen here where the design of a coin is produced from a large-scale model. Two-dimensional scale is helpful when drawing maps or architectural plans. But scale modelling allows more complex three- dimensional shapes to be made. The Spitfire is one of the most popular scale models ever created. It has a scale factor of 1 to 72. Measurements such as the Spitfire's length and wingspan were divided by 72 to give the new reduced dimensions. So with a real length of 9.12 metres and wingspan of 11.23 metres, the model length would be 12.7 centimetres and the wingspan would be 15.6 centimetres. As the length is scaled down, the plane's surface area is also scaled down. The length scale factor is squared to give the area scale factor. So there is an even greater difference between the surface areas of the two planes. The volume ratio between the model and the real plane is greater again. This is because a volume scale factor is calculated by cubing the length scale factor. This produces dramatically different volumes. Over 372,000 Spitfire models would fit into the original plane.